Edward Davis testified on Capitol Hill in 2013. WASHINGTON — The former head of the Boston Police, citing the 2013 Boston Marathon bombings and this year’s Paris terror attacks, is among a group of former intelligence and counter-terrorism officials calling for stronger domestic spying programs to detect ``homegrown’’ extremists. 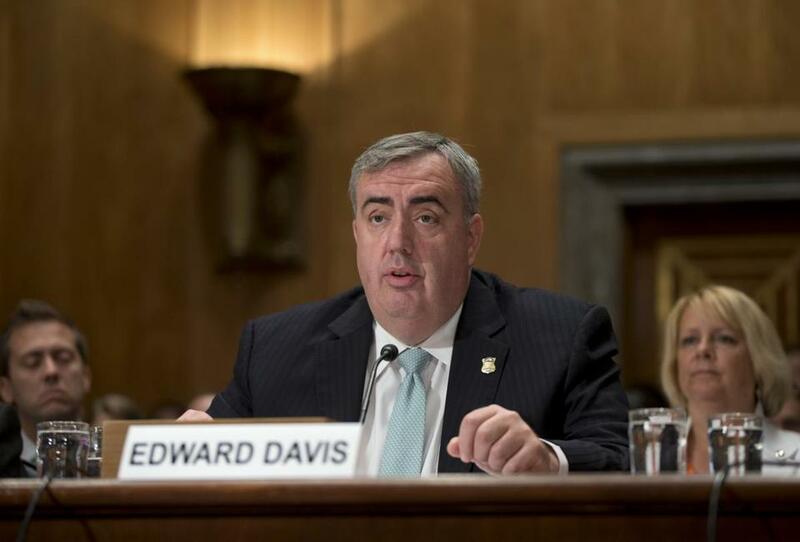 Former Police Commissioner Ed Davis, who oversaw Boston’s response to the Marathon attacks, helped draft recommendations for policy makers that includes establishing the new post of national domestic intelligence director in Washington. The group also is calling on the federal government to empower state and local police to conduct more sleuthing and surveillance of possible terror suspects. The proposals -- which already have drawn concerns about civil liberties -- would go beyond the steps taken in the wake of the Sept. 11, 2011 attacks. “You can call it gathering intelligence, you can call it being preventive, doing good police work, but the truth is we have to stay on top of what is happening in our cities,” said Davis, who left his Boston post in last year and is now a private security consultant. Davis was part of a group of more than a dozen former officials who released the report in Washington last week. Other members of the panel included Michael Chertoff , the former secretary of homeland security; retired General Michael Hayden, the former head of the National Security Agency; and Michael Leiter, the former director of the National Counter-terrorism Center. The recommendations have been presented to James Clapper, the director of national intelligence, and the staff of the intelligence and homeland security committees, officials said. Clapper’s spokesman said they are under review. They have also been shared with the FBI and the Department of Homeland Security’s Office of Intelligence and Analysis. The study was sponsored by Business Executives for National Security, a Washington nonprofit that is dedicated to solving national security challenges. Members include executives from a host of major defense, computing, and investment companies, including some with financial interests in government spending on intelligence-gathering. Davis was highly critical after the 2013 Boston Marathon bombings of what he called a lack of coordination between federal and local officials about what was known about the pair of suspected bombers, the Tsarnaev brothers, of Cambridge. The elder Tsarnaev, who was killed in a shoot out with police after the bombings, and their mother were interviewed by the FBI prior to the attacks. The new proposals, drawn from interviews with more than 100 senior intelligence and law enforcement officials, are already sparking new concerns they could erode personal privacy at a time when authorities are already under scrutiny for collecting private information from Americans in the name of terrorism. The report comes as a federal appeals court in Philadelphia is considering whether several individuals in New Jersey who claim they were spied on by the New York City Police Department purely because of their religious affiliation -- and without any criminal suspicion -- have a right to challenge the policy in court. He raised particular concerns about the call to establish a deputy to the nation’s chief intelligence official -- the director of national intelligence -- to coordinate “federal domestic intelligence collection,” noting that the organization’s role has primarily been gathering foreign intelligence and it is not experienced with the legal issues associated with domestic law enforcement activity. “It is much better to have the attorney general play that role,” German said. The report, titled Domestic Security: Confronting a Changing Threat to Ensure Public Safety and Civil Liberties, did stress that the new chief domestic spy should not have “operational” authority to spy inside the country and only play a coordinating role. They cited growing reports that Europeans and Americans have gone off to fight with the Islamic State in Iraq and Syria and other Muslim terrorist groups or have been radicalized on the Internet -- a very different circumstance than in the 9/11 attacks, which was perpetrated by 19 Saudi nationals. “As these threats continue to adapt so too must our nation’s domestic counter-terrorism efforts,” their report said. A major goal, they concluded, must be making better use of the estimated 800,000 state and local law enforcement officers around the country to help prevent terrorism. “With no clear federal leader orchestrating U.S. domestic intelligence efforts, state and local law enforcement entities remain underemployed assets and federal efforts remain disparate,” the report said. To enhance what they called “mutual awareness,” the panel also called for better analytical training for the FBI and local police and expanding the role of local “fusion centers,” established after 9/11 to serve as clearinghouses of intelligence and law enforcement information. Some local law enforcement officials, including Davis, have suggested that if local authorities had been better informed about the Tsarnaev brothers in Boston after the FBI opened and then closed a probe on the older brother the twin marathon bombings might have been prevented. “By centralizing the responsibility -- some oversight responsibility -- on how intelligence is gathered and setting clear guidelines on what should be done locally we are going to have a better system,” said Davis, who is currently a security consultant to the Boston Globe. Still, a number of counter-terrorism specialists predicted some of the recommendations, if adopted, would likely come under fire from civil liberties groups. “The word domestic intelligence itself is kind of a plutonium, a scary concept and a delicate business in a democracy,” said Brian Jenkins, a terrorism expert at the Rand Corporation, a government funded think tank. While he said he supports what the panel is trying to achieve, he said the public should expect some stepping over the line. Lee Hamilton, a former Indiana congressman who co-chaired the government commission that investigated 9/11 attacks, agreed.